Delivery from Saturday Order Now! For that special occasion, why not send them this year's first tulips fresh from Holland. Each bouquet is hand tied with a range of beautiful colours sure to brighten anyone's day. The bouquet is finished with dashes of gypsophila and completed with a bright pick for your recipient to keep long after the occasion has passed. 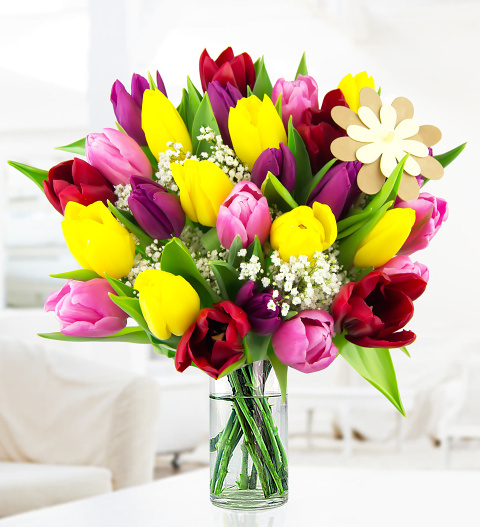 Tulips are a superb addition to any room and this bouquet will bring any lucky recipient plenty of joy. We have included tulips in various colours as well as gypsophila for that full effect and an artistic pick to top it all off. The perfect gift for birthdays, anniversaries, or even just because! Chocolates may contain nuts.